Nothing in the world breathes life into your home like a fresh coat of Dunn-Edwards paint. Use this step-by-step guide and our premium Dunn-Edwards paints and primers to achieve beautiful, long-lasting, professional-quality results. While any paint can give a home a quick facelift, a premium paint can truly transform a home’s interior and make it last. A premium paint offers a smoother, more uniform appearance, as well as much better coverage, than an economy paint. Because a home is a major investment, premium paint provides the long-term protection it deserves. The gloss level you choose for your paint project can have a significant impact on both appearance and maintenance. A color in a higher gloss paint will appear brighter and richer than the same color in a lower gloss. Also, higher glosses will have better washability and stain resistance, though they may also highlight defects and imperfections on a surface. Flat paints are a good choice for adult bedrooms, living or dining rooms, and ceilings. For these areas, we recommend SUPREMA® Interior Flat Paint. Velvet, Eggshell or Low Sheen paints can be used for high-traffic areas such as hallways, family rooms or children’s bedrooms. We suggest SUPREMA® Interior Velvet Paint, SUPREMA® Interior Eggshell Paint or SUPREMA® Interior Low Sheen Paint. Semi-Gloss paints are ideal for kitchens, bathrooms, utility areas, woodwork, doors and trim. Consider using SUPREMA® Interior Semi-Gloss Paint. These are commonly used gloss levels for the surfaces listed above. Gloss may be affected by texture, porosity of the surface and atmospheric conditions. Please contact a Dunn-Edwards representative or your local store for specific product recommendations. VINYLASTIC® Premium is a water-based sealer that offers excellent sealing qualities on new drywall and dries fast for same-day finishing. BLOCK-IT® Premium is a high-hiding, ultra-low VOC waterborne alkyd primer for use on a variety of previously painted or new interior and exterior surfaces. ULTRA-GRIP® Premium is an acrylic multi-purpose primer that provides superior adhesion, outstanding stain-blocking, excellent enamel holdout and great hide. INTER-KOTE® Premium is an acrylic enamel undercoater that provides excellent hide and sealing qualities for interior wood, hardboard and wallboard. EFF-STOP® Premium is an epoxy-fortified acrylic latex primer/sealer that provides very good resistance to efflorescence and alkali. Smooth BLOCFIL™ Premium and Medium BLOCFIL ™ Premium are heavy-bodied acrylic latex primers/fillers that fill and bridge voids and cracks in porous cinder block and concrete block. ENDURAPRIME® Metal Primer is a high performance, interior/exterior, ultra-low VOC, single component, water-based acrylic primer. It offers excellent corrosion resistance and adhesion on ferrous metals. BLOC-RUST® Premium (Water Based) is a white alkyd primer that provides excellent corrosion resistance on ferrous metals. Also available as red oxide. ULTRASHIELD® Galvanized Metal Primer is single component, interior and exterior non-ferrous and ferrous metal primer. It provides excellent adhesion to properly prepared and etched galvanized metal and other non-ferrous metals: aluminum, brass, and copper. 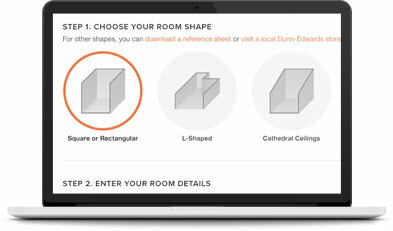 You can get a fairly accurate idea of how much paint you’ll need for your project using this simple calculator. How much paint do you need? Complete our step-by-step calculator to find out. When it comes to painting, proper preparation of the work area and painting surface is important to simplify the project and achieve better results. Clear the area before you begin. If that’s not possible, move large furniture to the center of the room and cover it with plastic sheeting. 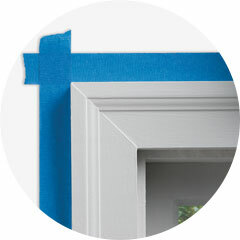 Cover the floor with plastic sheeting and, using safe-release painter’s masking tape (usually blue in color), adhere the sheeting to the baseboards around the room’s perimeter. Place a heavier canvas dropcloth atop the plastic to avoid an overly slick surface. Remove all hardware and anything hanging on the walls, such as electrical plates, cable TV outlets, curtains, art and nails. To cover chandeliers or other fixtures you cannot or do not want to remove, cut plastic sheeting to size and wrap and tape the item. Prepare the surface to achieve goodlooking, long-lasting results. A properly prepared surface is clean, solid and dry, without cracks or imperfections. Clean the surface of any dirt, dust, wax, grease, oils or other contaminants. Use a mild detergent and water or a commercial wall-cleaning product to clean the walls. Rinse the surface with clean water and allow it to dry. Repair, patch and caulk all voids, cracks and holes where necessary. Lightly sand repairs to achieve a smooth, even surface. Sand glossy surfaces to provide a roughened surface for good adhesion. Remove dust thoroughly before painting. CAUTION: Scraping or sanding surfaces of older buildings (especially pre-1978) may release dust containing lead or asbestos. EXPOSURE TO LEAD OR ASBESTOS CAN BE VERY HAZARDOUS TO YOUR HEALTH. Always wear appropriate personal protective equipment during surface preparation and finish clean-up of any residue by water-washing all surfaces. For more information, see Dunn-Edwards’ brochure on “Surface Preparation Safety” or call EPA’s National Lead Information Center at 1-800-424-LEAD, or visit www.epa.gov/lead or www.epa.gov/asbestos , or contact your state or local Health Department. If you have additional questions, please ask any of our expert sales associates. 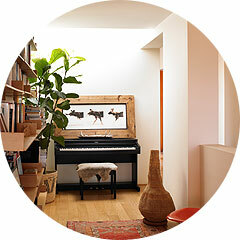 Use a brush to paint a 2-inch-wide strip along the ceiling and the floor, and around any woodwork. Use a roller, coming as close to the edges as possible, to create a clean, uniform finish. 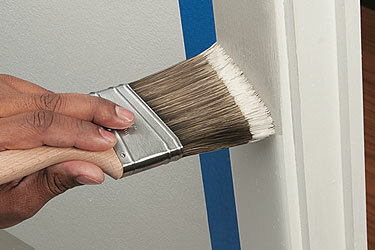 Using a brush, paint all trim around doors, windows, ceilings and floor. Start by pre-wetting your brush to dampen it before painting. Next, pour your paint into a small bucket. 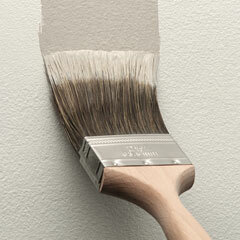 Hold the brush near the base of the handle and dip the bristles a third of the way into the paint. Tap (don’t wipe) the brush against the inside walls of the bucket. Paint with enough pressure to bend the bristles slightly. Don’t bear down hard on the brush. Start by pre-wetting your roller cover to dampen it before painting. Move the roller slowly into the paint in the tray, then roll it back and forth until paint cover is evenly coated. Roll onto the tray’s ridges to remove excess paint. Cover about a 2-square-foot area using the “N” pattern, rolling upward first, to minimize drips. Water-based paints make cleaning up fast and easy. Clean any spills with a damp cloth before they dry. Clean brushes, rollers and other tools with soap and water. Try to buy only the amount of paint you’ll need for your project. Save small amounts of leftover paint for future touch-ups. To keep the paint fresh for future use, put a layer of plastic wrap over the mouth of the can before replacing the lid securely. 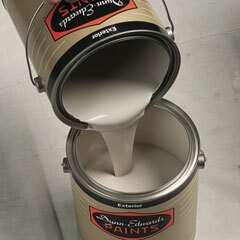 Cans with completely dried paint residue may be disposed of in ordinary household trash. Leave the lid off the container so the collector can see that the paint has dried. Never pour leftover paint down a drain on into a storm sewer. Washing dirt from painted walls before it accumulates not only improves appearance, it reduces the chance of the dirt becoming permanently embedded in the paint. Make sure to check for dirt periodically and assume it will be present in and near cooking areas (airborne cooking oil) and on areas that are frequently touched. After investing in your repaint project, we know you want to keep your walls looking clean and fresh for as long as possible. With a little care, it’s easy to remove average wear and tear and gain more time between touch-ups and repaints. When washing walls or removing stains, do only the minimum amount of cleaning, using the lightest pressure necessary, in order to avoid eroding the paint or creating any shiny spots (burnishing). Always use the least aggressive cleaner, such as a mild soap solution, and cleaning process that will remove the dirt or stain. Always wet a sponge before use to prevent excessive surface abrasion. Always rinse walls sufficiently with warm water. This is an important step, as any cleaning solution residue will attract dust and dirt quickly. It is not always possible to wash off all stains (such as permanent markers). These and other stains may bleed or show through when painted. If there is any doubt about residual stains, consider applying a high quality, stain-blocking primer, such as BIPR00-1 before painting. If cleaning or other burnishing has left the surface shiny in some areas, the primer will also give a consistent look. A home’s exterior can make or break that all-important first impression, so it’s vital to choose the highest-quality paint possible. To truly transform a home, and make a good impression last, select a premium paint, which provides a smoother, more uniform appearance, as well as better durability than economy paint. By using premium paint, your project will likely require fewer coats to give your home the protection it deserves. Also, you won’t have to repaint as frequently. Flat and velvet paints are best for concealing surface imperfections and are ideal for large areas, such as exterior wood, masonry or metal wall surfaces. We recommend EVERSHIELD® Exterior Flat Paint or EVERSHIELD® Exterior Velvet Paint. Eggshell and low sheen paints can be used in larger areas or on window frames and doors where a slightly higher sheen is desired. 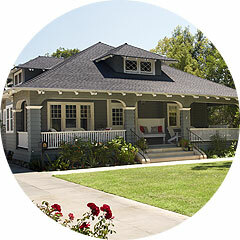 We suggest EVERSHIELD® Exterior Eggshell Paint and EVERSHIELD® Exterior Low Sheen Paint paints. Semi-gloss and gloss paints are best for highlighting details, such as window frames and doors, and are easy to clean. Consider using EVERSHIELD® Exterior Semi-Gloss Paint and EVERSHIELD® Exterior Gloss Paint paints. EZ-PRIME® Premium is a 100% acrylic primer that provides excellent enamel holdout and tannin stain resistance on woods such as redwood and cedar, which are subject to stain bleeding. SLPRA00-SLPRB00 is a water-based, two-component epoxy waterproofing concrete/masonry sealer that provides superior adhesion and outstanding alkali resistance. GAPR00-1 is a solvent-borne epoxy-ester primer with excellent adhesion and corrosion resistance for use on galvanized metal and aluminum surfaces, as well as ferrous metals. BLOC-RUST® Premium (Water Based) is a Rust Preventative primer utilizing waterborne alkyd technology that offers excellent corrosion resistance on interior and exterior ferrous and non-ferrous metals, except galvanized steel. Note: if you are painting a home with gables (a triangular area just below the roof), measure the whole structure from the base to the roof to obtain the height. This will provide some extra material to ensure you have enough paint on hand for the project. Weather and the elements are unkind to home exteriors and, over time, can severely damage paint; therefore, proper surface preparation is essential to achieve the best results. This begins by identifying and addressing the source of any problems before painting and using a primer if surfaces are unpainted or the original paint is in poor condition. Cut back shrubs and plants so they are easier to cover, but do not leave plants covered too long. Cover all objects and surfaces not being painted with plastic and make sure to move any cars away from painting area. Wash the area beneath the roof eaves to remove any dirt or surface contaminants. Wear goggles and protective clothing. Rinse area thoroughly with clean water. Remove surface dust and dirt using a cloth or soft brush and soapy water. Remove all stains, such as chalking and mildew. Repair all voids, cracks and holes. Sand all surfaces to smooth them out and use a wire brush or paint scraper to remove loose paint. Caulk all surface joints, cracks and seams. Make sure the caulking is thoroughly dry before painting. When working with bare surfaces, prime before applying caulk. Fill any cracks or large holes with a flexible patching material. 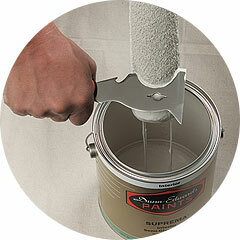 Allow the patching material to dry completely before applying primer. Prime any areas that have not been previously painted or any exposed areas where paint has worn thin, or is peeled or blistered. 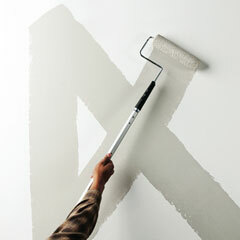 Allow all areas to dry thoroughly – one or two days may be necessary, depending on the primer used. Prime gutters and downspouts.If gutters and downspouts have been painted previously, remove any rust and peeling paint using a scraper or wire brush. Sand all edges and wash the area with a garden hose or power washer. New aluminum gutters and downspouts that are factory-finished should remain in good condition for several years. 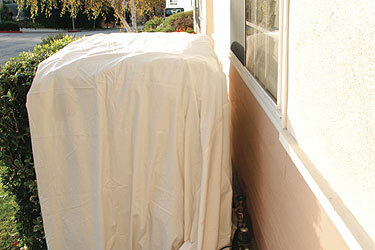 New unpainted galvanized gutters and downspouts are coated with an oil that must be removed prior to painting. To remove the oil, use a moistened rag with a solvent or a water-soluble degreasing cleaner and thoroughly wipe all surfaces. You are now ready to paint! 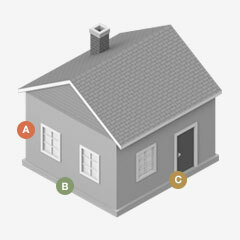 Apply the appropriate paint for your situation as recommended in Step 1: Choosing the Right Paint. When painting a house, it’s best to follow a time-tested plan. First, remove shutters and screens where possible. Start with the walls, then the trim. Follow up with the railings, porches, steps, foundation and shutters. Start on the shaded side and never work in direct sunlight. If you are using oil-based products, check that all dew has evaporated. As you begin each section, arrange your drop cloths to shield plants and other areas. Cover shrubs crowding the house, and pull them away from the house using staked ropes. Fill the brush by dipping it one third of the length of the bristles. Tap it gently against the side of the can, but don’t wipe the brush against the lip. The bristles should flex slightly as you paint (don’t press hard). 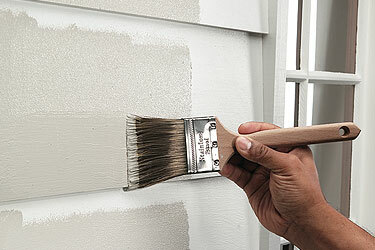 Each dip of the brush should contain enough paint to cover one foot of 8-inch siding. Use the brush to smooth the paint to an even finish. At each stage of painting, start at the top and work your way down. Paint along natural lines, using horizontal brush strokes for horizontal siding and vertical strokes for vertical siding. 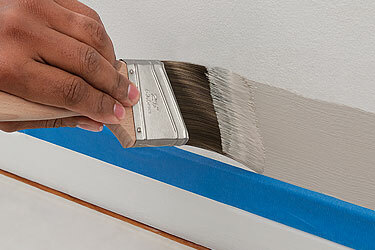 Rollers can be used after you've painted edges with a brush. Roll in light, even strokes in several directions. Roll slowly enough to avoid spattering, going as close to the edges as possible. Mix your paint to avoid slight color differences. Always try to find a natural break, such as the corner of a wall. If you see you’re running low on paint, open your next gallon and mix them together. Periodically check the condition of exterior paint to resolve any paint problems early. Cracking, peeling or blistering should be repaired quickly to reduce future repainting costs. Dirt accumulation can often be removed by rinsing with a garden hose.